"Is there a free iMyFone D-Back serial key?" We offer hear or read this from our usersand on various forums too. But what surprises us the most is that how easily some wrong information gets circulated over the internet. The most common wrong information is passed by the ones, who themselves do not know much about the technical stuff or how software serial keys work, be it an iMyFone D-Back serial key or other. For this reason, we have specifically tailored this post to spread the most appropriate information about iMyFone D-Back serial key. 1. Is There A Free iMyFone D-Back Serial Key? 2. Why Should You Buy a iMyFone D-Back Serial Key? Well, there are several different websites over the internet that do claim to offer iMyFone D-Back serial key as a crack method to make use of it as a full version (purchased), but the reality is far more different. There are 2 things that you need to understand about such activities. In actual, there is no such free iMyFone D Back serial key offered. This is because iMyFone regularly keep track of the status of the key provided to its customers, updates and deactivates them from time to time as per the status retrieved. It is very clear that there's no such free iMyFone D Back serial key available. You may find a iMyFone D Back serial key crack online. Now, if you make use of it and if it get tracked that you're making use of illegally obtained iMyFone D-Back software, you may end up in a legal problems. According to the law, if you do not possess the appropriate licenses of utilizing software (which is supplied after purchasing software) or making copies of the software without the permission of the copyright owner is considered as copyright infringement. Therefore, you may end up finding a serial key that doesn't work. If you download and use a crack software even when you do not have legal rights to do so, it is deemed as copyright infringement. 2. Why Should You Buy an iMyFone D-Back Serial Key? First of all, every single software that is developed takes a whole lot of investment, not just in terms of money but also in terms of time, dedication and effort. It takes months or sometimes years to develop a software that serves the needs of the people. Moreover, it is not a one time goal, software has to be maintained and updated regularly so as to deliver the best user experience throughout its life. Hence, every software out there is worth paying for. Now, you may wonder what goods a purchased iMyFone D-Back serial key would bring to you. This section of the article will help you understand every single benefit that you can enjoy if you use a purchased version. On top of all, your data and privacy will be intact with the 100% Privacy Protection Policy. Crack software may carries some unknown plug-in and even virus. You don't need to waste a lot of time to search and test the free serial keys, eventually saving up more time. You're enabled to use the entire features of the software freely without any restrictions and with far better performance. You get to enjoy the end to end customer service support in case you face any issues. In addition to that, sometimes you may also get to recover more data with the assistance of the technical team. Here in this section, we have brought to you the quick snapshot view of various different license types offered for different needs by iMyFone D-Back. The license is supplied to the registered email ID with your copy of iMyFone D-Back serial key. Go through the table below and you'll get to understand what exactly is covered under the different license types. Impressed with the full featured iMyFone D-Back? Well, if you wish to acquire one for yourself now, we have good news for you. Here's a discount coupon for you. Make use of this code to avail the offered discount on your iMyFone D-Back serial key. For your convenience, here's the step by step tutorial on how to use this code. 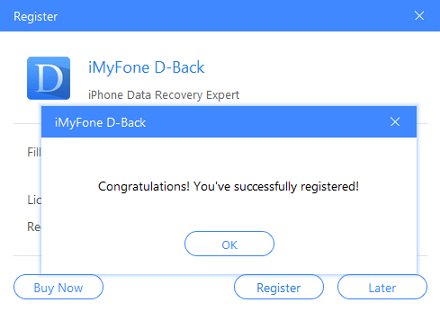 Visit the iMyFone D-Back official webpage, move your mouse on the 'Buy Now' button and then select the OS of your computer you require, i.e. 'Windows' or 'Mac'. Next, you need to select the 'Add to Cart' option on the desired plan that you wish to opt for. You'll now be redirected to the 'Checkout' page. You're now required to hit on the checkbox available besides 'Check to enter coupon code' under your product information. A text box will now be visible, punch in your discount code into the text field and hit 'Apply'. You need to key in your contact information like Full Name, Address, Email and other required fields. Opt for the Payment option that you feel comfortable with. Lastly, review your order and consummate the payment process. You're all sorted now.